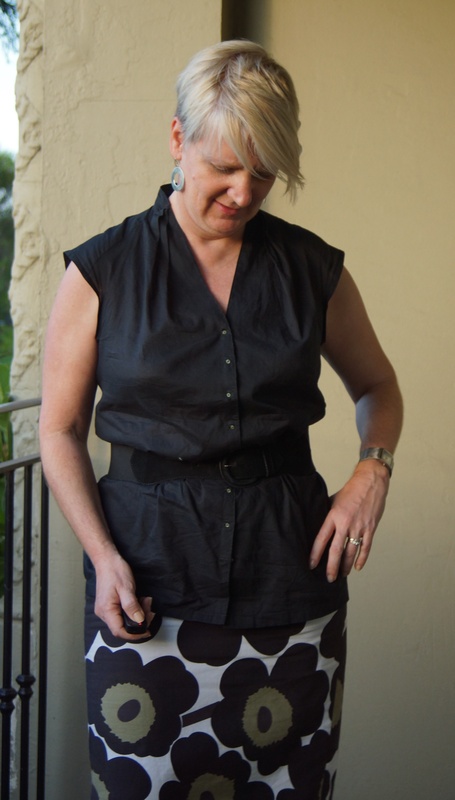 This blouse is BurdaStyle 2011-09-128, in a cool black cotton voile from The Remnant Warehouse. 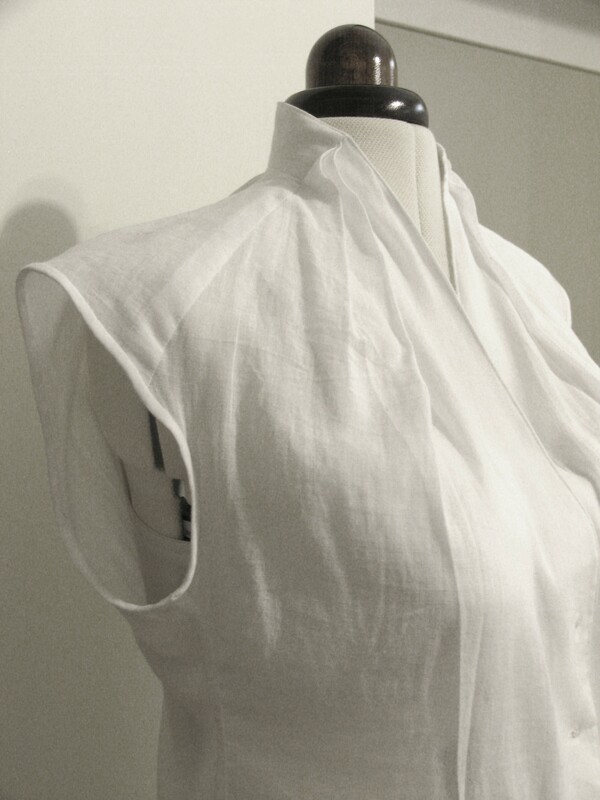 It was an instant favourite when the issue first came out and I initially made it in a luscious white cotton voile (see review here) but it always looked better on Dolly …mainly due to the shoulders being too big. With FBA knowledge, I made it two sizes smaller… the shoulders fit soooo much better! Interestingly, there was still a LOT of room in this blouse, so I nipped in the back with a wide pleat, running from mid back to below the waist. 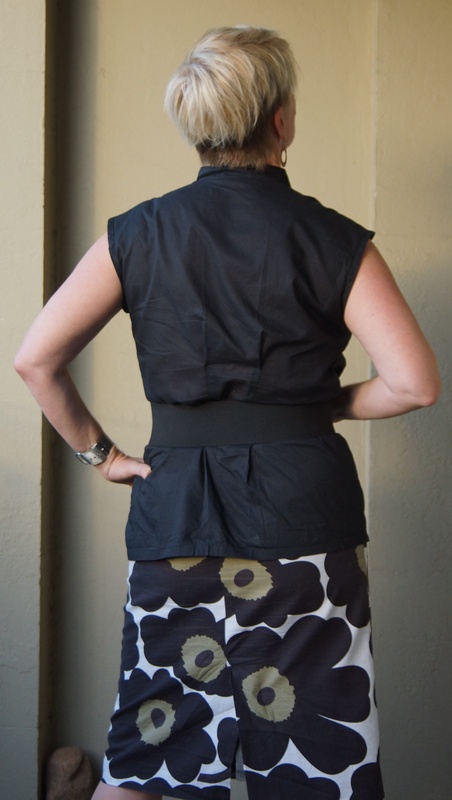 The problem is that the pleat gets rather crumpled by the end of the day…the sides of the pleat are even – but these pics show me I need to be more careful to avoid mooshing it with the belt! I added tiny little buttons, which I think look more RTW? 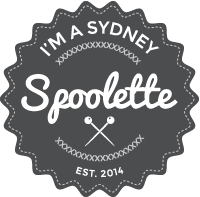 They’re from the wonderful All Buttons Great and Small, in Newtown, Sydney. 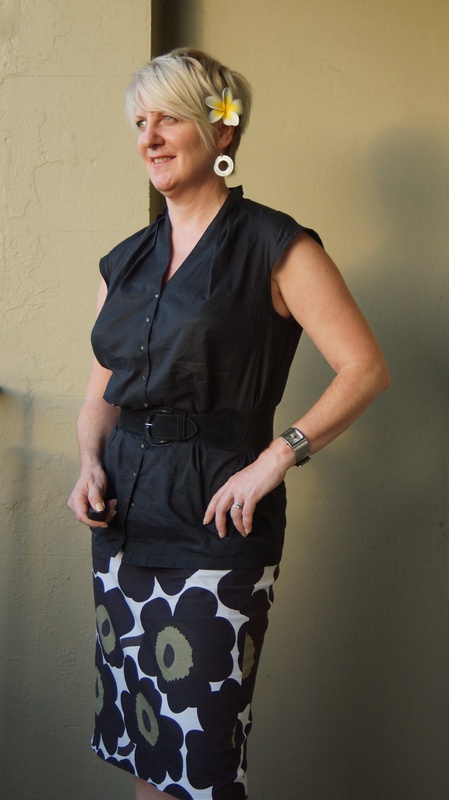 The skirt is Butterick 5466, one of seven versions from my ‘skirt-a-palooza’* affair with this pattern! I still wear every one of them, regularly! 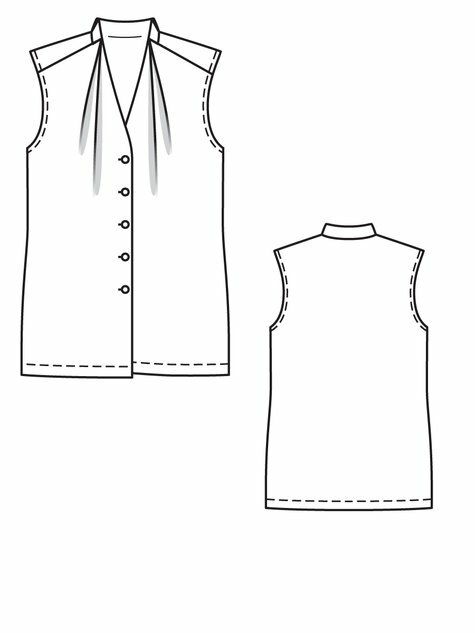 A great confidence booster of a pattern for first-time or ‘returning’ sewists! The fabric was from Spotlight’s quilting cotton section!!!? ie not the real-deal-Marimekko. I wouldn’t have been mucking around with the real deal in those early days! I have been known to drool on the front window of the gorgeous Marimekko store in Sydney. It was also made before I knew how to print match…ah well…I still love it. In conclusion: a summer basic which goes with all those Butterick 5466’s!! *The lovely ArtAttack coined this perfect description!